There are lots of new aspects to the Room 2 over the original. It looks more modern, and is less than a quarter of the original size, replacing the white plastic with a svelte aluminum frame. A new e-ink display is on the front amid a black plastic bezel. Using the screen, metrics can now be assessed at a glance right from the Room 2 without having to query Siri or open the app. There are four different display modes, one showing all three metrics, and the others highlighting one in particular. They can be cycled through using the arrow buttons to either side of the display. Battery-wise, a trio of AA batteries have been tossed in favor of a new lithium-ion battery that charges over micro USB. We're not thrilled with another new product utilizing micro USB over USB-C. For a product like this that we'd expect to be around a while, it is disappointing to see that legacy connector still being included. This built-in battery should last approximately six weeks with normal use. As the battery depletes, Room 2 will automatically switch to energy conservation mode. In this mode, only humidity and temperature data will be collected. Air quality is a bit of a battery intensive metric, which explains the limited battery lifespan. Based on our testing Eve Room is quite accurate in its readings. For temperature, it has an operating range of 0C to 50C (32F to 122F) and is accurate to within roughly half a degree on the Fahrenheit scale. When we used our digital Thermapen to compare, they within .2 degrees of one another, more than accurate enough to adjust your home's temperature. Humidity, which has a degree of accuracy of within 3 percent, also seemed to be on track, reporting extremely close numbers to our other air quality measurement devices. Air quality is one of the hardest to pin down because it can mean so many different things. We recently reviewed the second generation Awair sensor, and it collects five different metrics to give you an air quality rating. In the case of the Eve Room 2, it measures volatile organic compounds (VOC) in the air. This encompasses any of thousands of carbon-containing chemicals that can be in the air. These gases in the air are detected by the Eve Room 2 and displayed in PPB, or parts per billion. VOC can be emitted by many things in a home including stoves, chemicals, building materials, personal care products, smoking, air fresheners, office equipment, furnishings, cleaning compounds, and more. These can cause a variety of health issues including eye/airway irritation, respiratory symptoms, inflame allergies, and more, depending on the levels and amount of exposure. 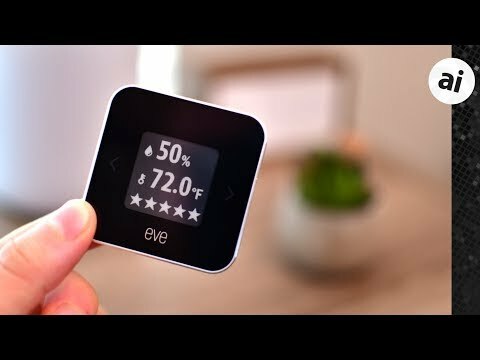 The Eve Room 2 takes these measurements and presents them as a star rating within the app, and on the screen to give you a simplified understanding of your home's air quality. Eve's app has long been one of the best HomeKit apps out there -- especially when looking at the free options. When it comes to the measurements collected through the Eve Room 2, you're better off using Eve's app rather than the Home app. In Apple's Home app, you get simplified values for each of the metrics, such as "excellent" air quality, a percentage for humidity, and a number for temperature. In Eve's app, you can get the exact parts-per-million value of the air quality, as well as the generalization. You can also view graphs for all these data points over the past hour, day, week, month, or year. If you really want to get granular, you can view each and every data point plus when it was collected. There are more automations that can be created as well. Instead of creating a rule that turns on a fan when the air drops to "poor" air quality, and you can do it when a specific PPM value is hit. Novice users will be able to do plenty with Apple's offering, but for those going to the next level, the Eve app offers much more specific control. The simple setup process solely consists of opening the Home app, tapping add accessory, then scanning the HomeKit code on the bottom of the unit. Within a minute or two, the Eve Room 2 is added to your home. There are other areas you can get into when adding the Eve Room 2, such as setting a specific name for each metric and choosing a specific room in your home -- both useful for identifying them within the Home app and when conversing with Siri. When we set up our Room 2, we did have a firmware update to perform, which is one of the messier aspects of HomeKit. Updates are required to go through the manufacturer's app rather than the Home app. So to update the Room 2, you have to open the Eve app and find the accessory. Out of the gate, it may take a few minutes for data to start propagating, especially air quality which was the last metric to show in the app. For remote access, you will need some form of Home Hub, which means either a recent Apple TV, HomePod, or an iPad that stays at home. There are a few common automations that users may want to do with the Eve Room 2. As an example, an air purifier can come on when the air quality drops. Or the ceiling fan can turn on in the living room when the temperature gets too high on a muggy day. A dehumidifier or a humidifier can spin up when the humidity level raises or lowers. If you've paid attention to previous Eve products, then you'd be forgiven for mistaking the Eve Room 2 for the Eve Degree. They look nearly identical with the same aluminum construction and e-ink display. However, there are actually many differences separating them. They both are HomeKit sensors reading temperature and humidity, though Eve Room is meant for indoor use, for instance, and adds the air quality sensor. Batteries are also different, with the Eve Degree using a replaceable coin cell battery vs Eve Room 2's integrated rechargeable battery. The Degree does have more longevity on a single charge, lasting for an entire year before a new battery is needed. If you are looking for just humidity and temperature, go with the Eve Degree. It also is the only one of the two rated for outdoor use. Air quality sensors in HomeKit are a bit scarce. There is really only LaserEgg 2 (and LaserEgg 2+), Netatmo Healthy Home Coach, and the Eve Room 2. When looking at them, the Room 2 is well positioned. It is by far the smallest and most compact, and also doesn't require a wall power adapter. The built-in screen provides constant information, and it is discreet enough to blend in to most homes' interiors. Netatmo has a handy touch-sensitive top with a status color displayed on the front, but that doesn't reveal a lot of information. The LaserEgg 2 and 2+ have a screen, but of course still, require a power adapter like the Netatmo. Between the three, the Room 2 is best for the vast majority of people. Between the three, Eve Room 2 is best for the vast majority of people. Currently, Eve Room 2 is available for pre-order from either Amazon or Eve System's website for $99.95. Shipping will begin starting on September 12th. You should add iHome to the competition. We have been impressed with the iHome iSS50 5-in-1 smartmonitor/sensor (temp, humidity, sound, light, motion). We have three and find they are very useful and accurate. Air quality is not provided, but that is not a deal breaker for us. You can set up rules within the app easily for example to control switches - we use one to control on/off for a dehumidifier within set humidity and time parameters (at night when rates are cheaper) in a remote property. Also for security the motion and sound work well together to know when people are in the place. Best is the cost. At 1/3 the cost of the Eve, you get a lot. These work with HomeKit and Siri but since we do not have a spare Apple TV to use as a HomeKit hub, we just use the iHome app which works well. Obviously you never actually tried setting up an automation in the Eve app. I tried several times and it does not trigger the plug I assigned to turn on my air purifier. Eve tech support isn’t able, or is it willing, to help. I’m forced to return the Eve units since they aren’t making my home any smarter and aren’t doing what Eve claims they will do.